Sweet potatoes, one of the most ancient, nutritious, and valuable food crops of the Americas, are somewhat underused and misunderstood. 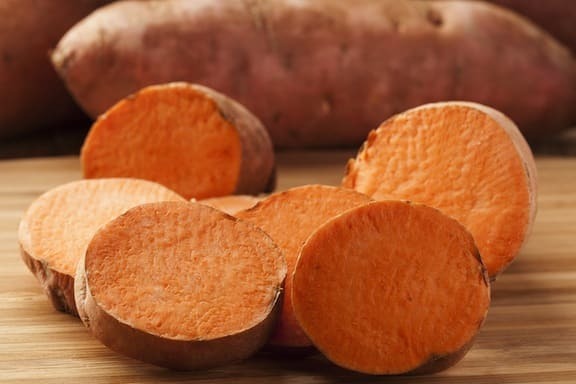 What is called a “yam,” for example, is often really a sweet potato. If what you’re buying has a vivid orange flesh, it’s a sweet potato. Even deeply hued Garnet Yams are a type of sweet potato. Not to diminish the value of regular potatoes, but as a point of comparison, sweet potatoes are substantially richer in nutrients. They are especially high in vitamin A and the major minerals. I think that sweet potatoes deserve far more attention. Southern or regional American cookbooks are a great source of recipe ideas. Otherwise, just bake or microwave them for a nourishing side dish.